I sent this email to Forrester earlier and will be awaiting their reply. Update: Forrester replied almost immediately, forwarded to their data team. Update 2: The Data team does not believe the data came from them and Andre Kindness has stated that the information came from him. Update 3: From twitter discussions, Andre has stated that he used a non-supported (no smartnet), no frills Nexus, which would be 14k street. The Cumulus software he used includes 24×7 support and a L3 forwarding license, which means the same would need to be included in he Nexus configuration to be a correct comparison. Forrester has supplied a copy of the report and I have done some analysis. I have supplied my feedback and will continue to work with Forrester to hopefully clarify the costs shown in the report. 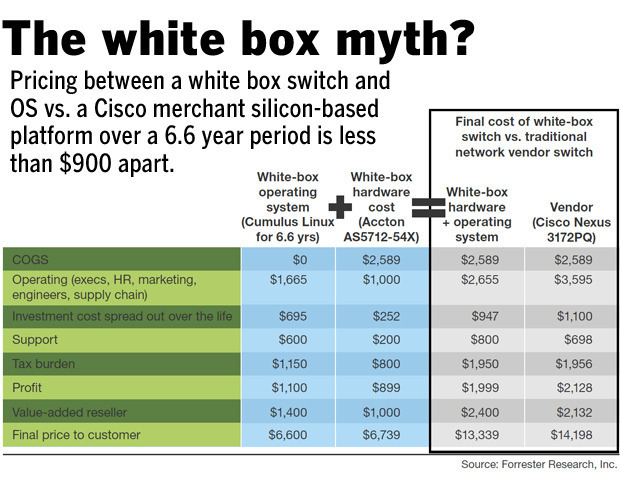 I have been going over the numbers that Jim Duffy published from Andre Kindness’ report “The Myth of Whitebox Switches” https://www.forrester.com/The+Myth+Of+WhiteBox+Network+Switches/fulltext/-/E-RES118267 and I am unable to determine the source of the numbers. I am unable to find the publicly available numbers that Andre points out exist, all I can find is the purchasable report, which is not public. In the slide Andre puts together the numbers for a 6.6 year cost of ownership for the Accton 5712 and the Cisco Nexus 3172PQ and the numbers come out within 1k of each other, $13,339 for the Accton/Cumulus and $14,198 for the Cisco Nexus. Where does Andre get the pricing for the Nexus? Even using government pricing, a heavily discounted Nexus 3172pq is still $11,760 and the cost of SmartNet service is about 1k a year. That would bring the numbers to ~17k not including taxes, duties, etc. For the Accton AS5712, his numbers are closer, the public non-discounted hardware being $6570 and software being $2849 (3 year) or 4,499 (5 year) but not anywhere near the costs of the Cisco. I plan to put all of this data out publicly, for no cost, and use it when training end users at public events (again for no cost). I will publish first on sonn.com (my personal blog) and once I can assemble everything with confidence, I will put the breakdown on RouterAnalysis.com where we do completely open testing of network devices for the public good.